The Major Town Houses of the Architect Victor Horta (Brussels) are pioneering works of architecture in the Art Nouveau-style. The site consists of four houses: Hôtel Tassel, Hôtel Solvay, Hôtel van Eetvelde, and Maison & Atelier Horta. Victor Horta was born in Ghent and lived between 1861 and 1947. He was one of the most prominent men in the Art Nouveau-movement, a new decorative style that developed in the late 19th century. Characteristics are for example the use of industrial materials like steel and iron in the visible parts of houses, new decorations inspired by nature, decorative façades of houses. Most of these principles can be seen in the house that Victor Horta built for himself in the late 1890's. This house now is a museum. Hôtel Solvay is a late 19th century city villa in Brussels by design of the Belgian architect Victor Horta. It is 1 of his 4 Major Town Houses. I visited it two weeks ago on a special tour in Dutch. They want to keep it exclusive: the tours are only once a month and a ticket costs 40 EUR. You must also book well in advance online. In 2002 I already had been to one of the other locations (the Horta House & Atelier Museum), which has no such visitor limitations. It lies only 500m away from the Solvay and a third location (Hôtel Tassel) is also just around the corner. At noon, around 25 visitors gathered in front of the imposing façade of the Hotel Solvay at the Avenue Louise number 224. We were given solid plastic covers for our shoes so that we would not tarnish the interior. This is now a busy neighbourhood, with a lot of traffic, embassies, shops and restaurants. The 19th century house is wedged between two ugly office buildings. When the house was built it was free standing and occupied a large piece of land: 15 meters wide and 20 meters deep on a main avenue between the city center and the surrounding forests of Brussels. The tour started with an explanation about the Solvay family, who had this house built in 1894. They had become rich on the chemical production of soda and gave Victor Horta a free hand to design a winter residence (they also had an estate outside the city borders). Later the house came into the hands of another rich family (Wittamer) who used it as a bridal fashion studio. Nowadays it is still in private possession of that family and that is also given as the reason that you are not allowed to take photos of the interior. But this is not an inhabited house: except for guided tours like the one I joined, it is also rented out for meetings and other gatherings. The most spectacular part of the house is located right behind the front door: a double, openwork staircase ending at a huge impressionist painting on the first floor. Horta was known for using visible metal structures in his designs for houses, materials that until then had been used mainly for stations and factories. Various expensive types of wood (including from Congo) and marble have also been processed into this house. Through skylights and many windows there is a lot of light in the house. On this gloomy afternoon in December however, lights were needed to illuminate it a bit extra. The interior of this house is still completely intact, including furniture designed by Horta himself and works of art coming from artist friends of his. In every room the chairs are of different designs and there are many frivolous details such as sliding doors and hidden toilets. The bottom 2 floors were used to receive guests, the family lived at the top floors. The latter spaces were also more soberly decorated. Here you can see at the ceilings that even in this house not everything is in perfect condition: the layer of paint is coming off. The owners also had a large number of staff living and working in the house: they could move completely out of sight of the guests 'behind the scenes' via their own corridors and stairs. Hôtel Solvay is considered the best kept of the houses designed by Horta in Brussels – both by the ICOMOS advisors and the guide that showed us around. It surely is an advantage that it receives relatively few visitors, so the carpets etc (all original!) do not suffer too much. 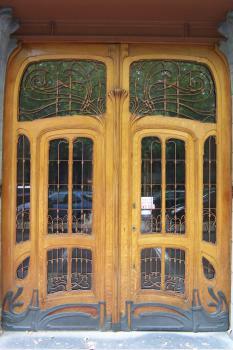 When you’re interested in Art Nouveau it is certainly worth this splurge. Next to Dutch, tours are also available in French but not in English as far as I have gathered from the website of Explore Brussels. Here is another World Heritage Site in Brussels that has been listed but is difficult for the public to access. Three of the four houses are really difficult, although there are some limited opening times for one of them.. 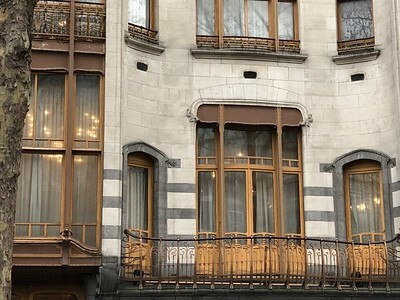 Unlike the other three Victor Horta houses in Brussels that are part of the World Heritage Site, the Horta Museum does give you the opportunity to go inside one of the original buildings and get a sense of the design and layout. Rather than just read about the influence on Art Nouveau architecture, you can see it for yourself. Rather than just look at each element in books or online, you can feel how they merge together. The opening hours are still somewhat limited, though. During my summer vacation in Brussels I visited the four inscribed Horta houses. The Horta Museum is lovely and nicely overwhelming. An absolut must. Since the other three houses are not open I booked a tour on Arau.org. 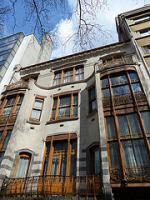 They make an Art Nouveau tour every saturday and visit two houses (not necessarily by Horta). In our tour we visited the Maison Autriche and the Maison Eetvelde, both by Horta. The first one is a museum that you can visit independently but the second is a privat house with a very nice interior. In general though I would not really recommend this tour. The group was very big and the tour was given in French and English by one guide. She was decently knowledgable but she often made mistakes and she gave all the explanation in both languages. Sometimes the group was split and entered the house in turns. All of this meant a lot of waiting, lots of repeats. And in the end it was a three hour tour and only ten minutes in the Maison Eetvelde, that you couldn't enter normally. If you know a little about Art Nouveau the only reason to take the tour is to get inside one of the private houses but be sure to check beforehand which houses are on the schedule. Otherwise I recommend to visit the Horta Museum and the other Horta houses that are open to the public like the Maison Autriche and the comic museum. The Maison Tassel and Solvay are also impressive from the outside. 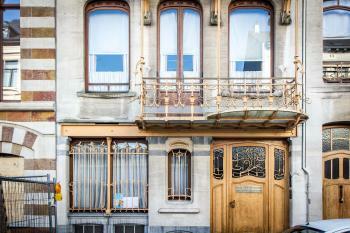 But as important Horta is there are a great many other brilliant Art Nouveau buildings by other architects in Bruxelles and in some areas like Ixelles, Saint-Gilles or Schaerbeek you can wander for hours and discover one gem after the other. Some of them are covered by the nice map Bruxelles Art Nouveau by ARAU which is available at many Art Nouveau museums in several languages. Some very nice and open Art Nouveau houses are the Hotel Hannon (Espace photographique Contretype), the Old England (Museum of Musical Instruments) and (as far as I have heard) the Maison Cauchie. In addition there are very nice displays of Art Nouveau furniture and art in the Musée des beaux-arts and the Musée d'art et d'histoire. I have certainly never visited a city with so much Art Nouveau. There is a lot to explore even beyond Horta and a much of it is quite wonderful. I was lucky enough to visit some of the Horta houses in October 2011 when they were opened to the public. I can see a Horta house from my window since I'm lucky to live close to one of them. The trail by walk or by bike is really worth it! These four houses are some of the finest city residences in Europe, and in my view the finest works of the Art Nouveau movement. The main problem is that the incredible interiors are mostly out of bounds for mere mortals. The exception is Musée Horta, which is my ‘Must See’ sight in Brussels. It is a fairly small museum but the incredible detail of design can be seen on every surface, even the most functional aspects of the interior, such as the door handles have been laboured over. The canopy at the top of the staircase is incredible. Though they may look twee and escapist the buildings were actually at the forefront of technological advancement, using iron as the frame of the buildings and actually exposing it, as it was a revolutionary technique at the time. Of the façades that can be seen Hotel Van Eetvelde is perhaps the finest, Hotel Solvay has some great details the ornament of the door and the numbers are great. Hotel Tassel from the outside looks pretty uninspiring, however inside lies perhaps the finest piece of Horta’s work, the mosaic floor and painted walls of the staircase are sublime. On two occasions I have even chosen to stand outside having a cup of coffee in the hope that the owner would walk by, take pity on me and allow me a quick glimpse, needless to say this has never happened. There are many great Art Nouveau buildings in Brussels, my favourite is the Old England Building which now houses the Museum of Musical instruments. If you are keen on this style it is worth looking at ARAU.org as they run tours of the main buildings in both French and English, which sometimes allow you to see the impressive interior of Hotel Van Eetvelde. 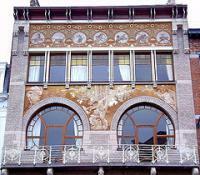 There are many cities with great Art Nouveau flourishes; (Paris, Vienna, Chicago, Prague) however Brussels is the finest and it is right that Horta’s major works should be highlighted by their place on the list, hopefully this broader heritage can receive the same protection and attention, including the incredible Palace Stoclet which is on the tentative list but is facing the threat of its interior being broken up and sold. I really love these buildings and a trip to Brussels would really not be complete unless you get to see something of these incredible works of art. 2.5: Alias65 Ilya Burlak Randi Thomsen Assif Peter A. 305 Community Members have visited.